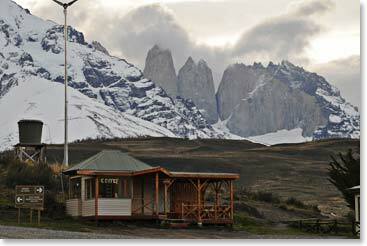 This is Leila reporting from Torres del Paine. 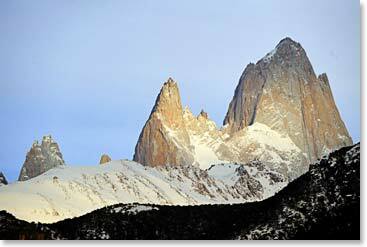 Today we woke up in El Chalten, where we were blessed by an amazing view of Fitz Roy. 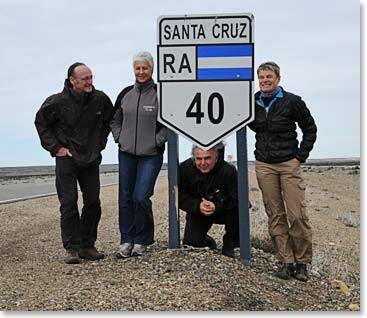 Today we traveled the 220 kilometres from El Chalten to El Calafate, both in Argentina, and then we continued south on one of the world’s great “lost highways,” Route 40. At an unmarked dirt road we took a shortcut west toward the Chilean border, headed for Torres del Paine National Park in Chile. The drive was beautiful, remote and desolate. We were all tired due to a long day on the road, but still happy to be here in great weather with the sun shining. After a quick check-in with the park rangers, we had a great dinner and made plans for tomorrow. 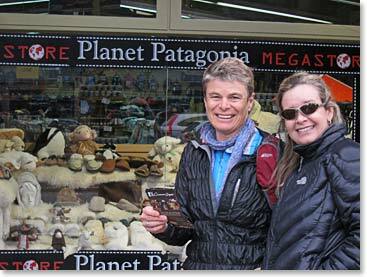 For Sharon and Sue, a long trek is in order tomorrow. George intends to wake up extra early and take advantage of the good light for taking photos, and Regi wants to rest and relax. We have a couple of days here before we start our W trek, which is the highlight of our trip. 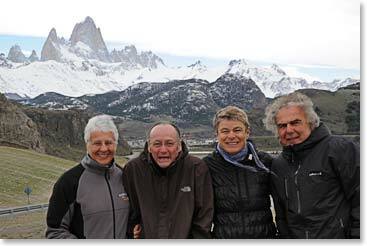 We were already able to see the Torres del Paine, which are gigantic granite monoliths shaped by glacial ice. They were not 100% clear because there were some clouds around, but it was great to see them, all the same. 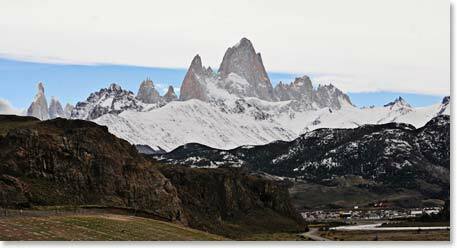 The Torres del Paine National Park is situated in an area of 2,400 km² and it was declared a Biosphere Reserve by UNESCO in 1978. Our goal is to hike the "W" route, named for the shape of the route. Hikers start and finish at either of the base points of the "W", performing each of the three shoots as a day trip.